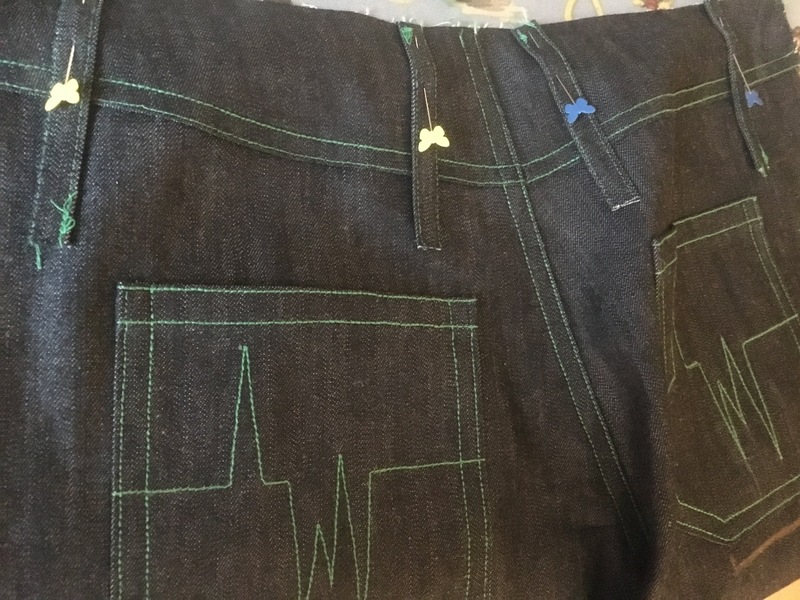 I’m re-making my personalised jeans based on the Thread Theory Jutland Pants pattern… This time I’m personalising them a bit more. Also, rather than trying to get them done in a day, I’ve broken it down into 13 sections. 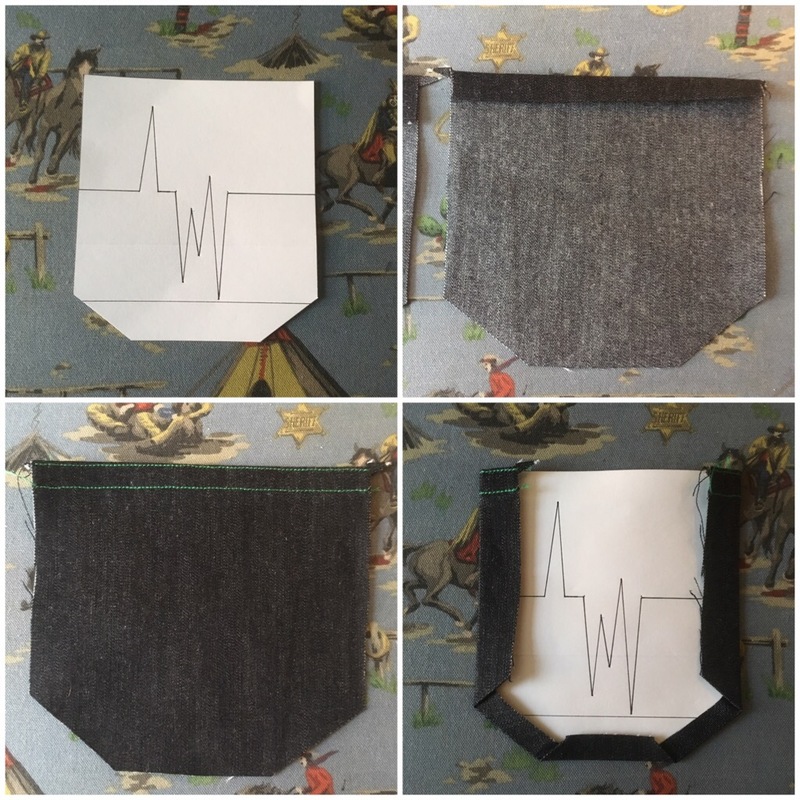 This isn’t a sew along or a tutorial, it’s just a step by step of how I made them, with a few findings/ opinions along the way! If it helps, interests or encourages anyone, that’s a bonus! I’d love to hear your comments and tips too. It’s quite a long post, so I suggest making a cup of tea or pouring a glass of wine before you start reading! I’ve already added a yoke, coin pocket and swapped the welt pockets out for patch (also button fly, but sticking with the zip for this pair). I don’t always follow the recommended order of construction, generally, I like to do all the little bits first. 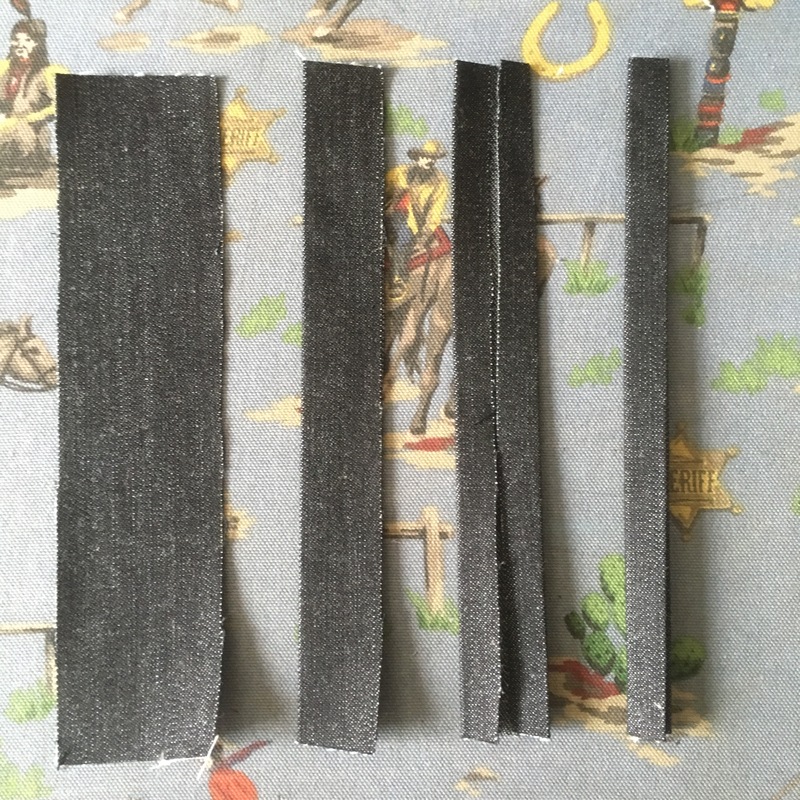 It’s a good idea to staystitch any curved or bias cuts and finish the edges of loosely woven fabrics, especially if they’re going to be taken out & put away a few times over the duration of your make. I’ve learned the hard way that this will help your pieces keep in shape. I’ve also learned the hard way not to finish the edges of pieces you intend to flat fell! So, to warm up, I started with the belt loops. I used two threads in my needle to give me a strong (fake) topstitch; a tip I picked up from @Thriftystitcher‘s online tutorial, thank you! Fold & press in half lengthways. Open out and fold & press edges in to centre. Fold & press in half again. Then I stitched them using the stitch in the ditch foot, with my needle double threaded and ‘5 beeps’ to the left. Then I put them away for later. 2. Front Pockets & Linings. 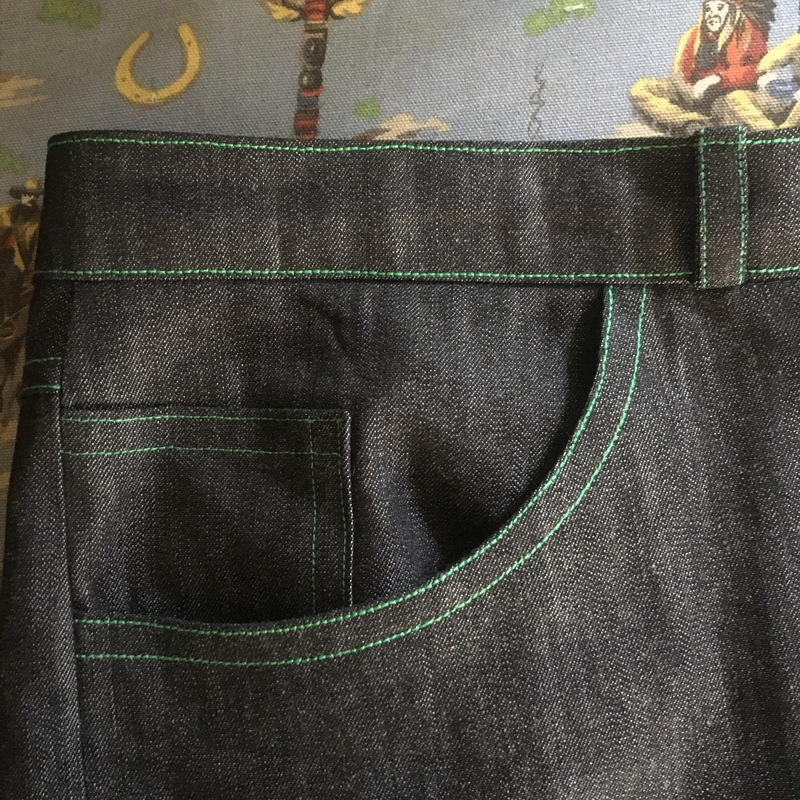 I’ve added a coin pocket to the right front pocket. 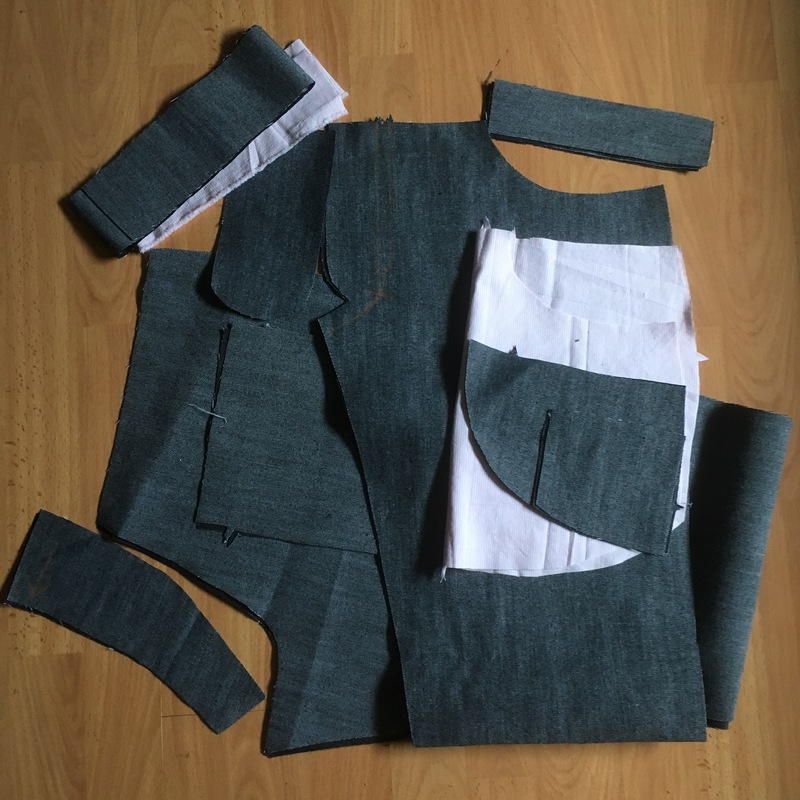 To make the pattern, I simply overlaid the paper pieces for the front, pocket lining & pocket facing. Then on another sheet of Swedish Tracing Paper I drew where I wanted the coin pocket, adding seam allowance on the two exposed sides. I zig zagged at 3.5cm width & 1mm spacing on three sides of the coin pocket. Fold in 1.5 cm hem on the two exposed sides, mitring the corner. Topstitch top of coin pocket. 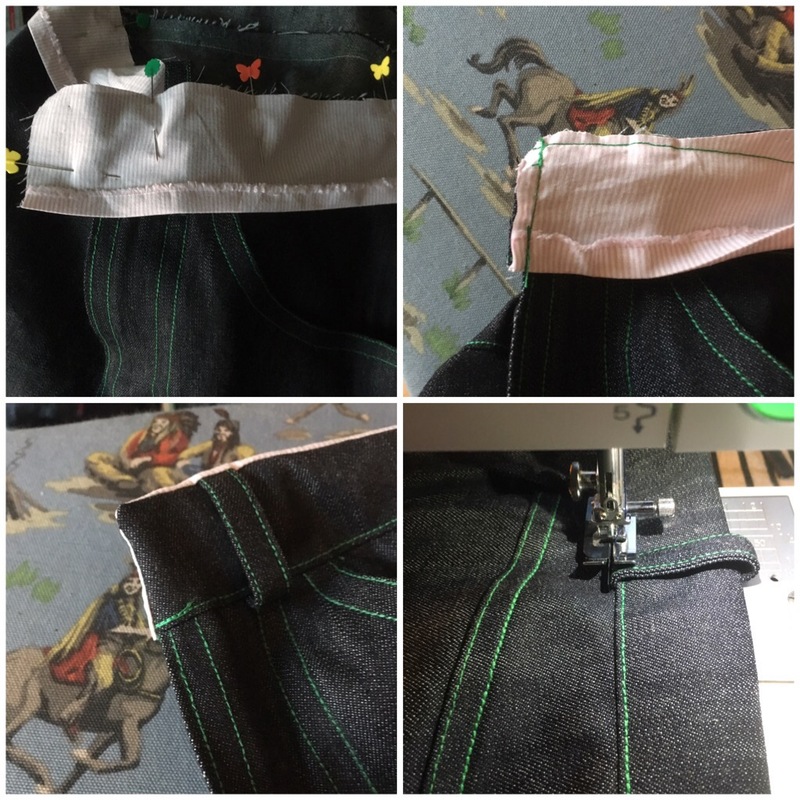 I use the lock stitch function (on my Janome DKS30 – I LOVE my sewing machine!) to start & stop neatly. And I use the same settings for all my twin topstitching: 1st row, edgestitch with the ‘stitch in the ditch foot’ and needle offset 5 beeps left. 2nd row, topstitch with normal needle position & the edge of the foot against the previous row of stitching. 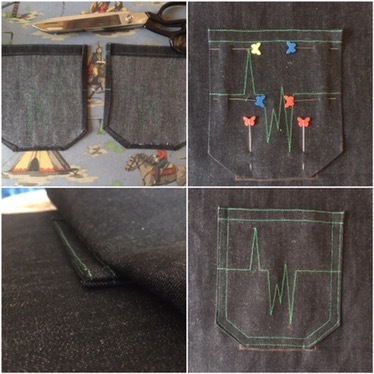 Match the notches and sew the facing to the pocket bag. I stitched normally to attach the curved edge, then changed to a basting stitch (.5mm) for the straight edges. They’ll be back later, it’s back pockets next. I made a template of the finished pocket size. I use this for all the ironing so that both pockets are symmetrical. First I finish the top opening, folding it over the template then folding the edge under. Pressed and double topstiched. 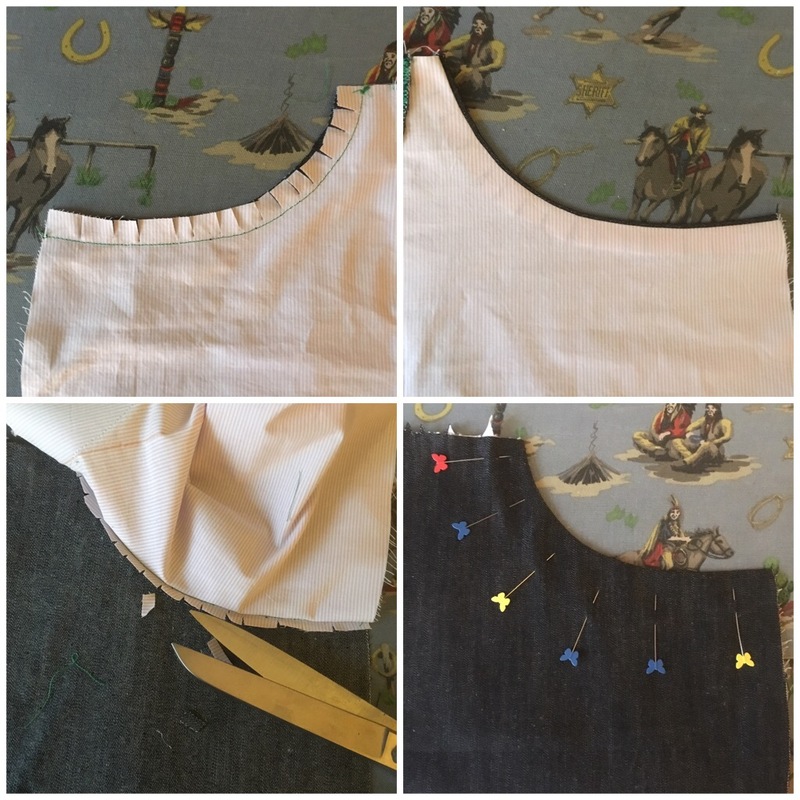 The top has a wider hem than the sides so I sew this one slightly wider, beeping the second row all the way to the left. Then I get the template back out and press all the seams in. Using the template on the right side (it’s my initials, so I’m not reversing the design) I mark the points of the design. I poked through with a pencil first, tried one with chalk and the other with crayon. It’s pretty clear to see that if I want to replace my chalk, I’m going to have to keep my crayons much sharper. 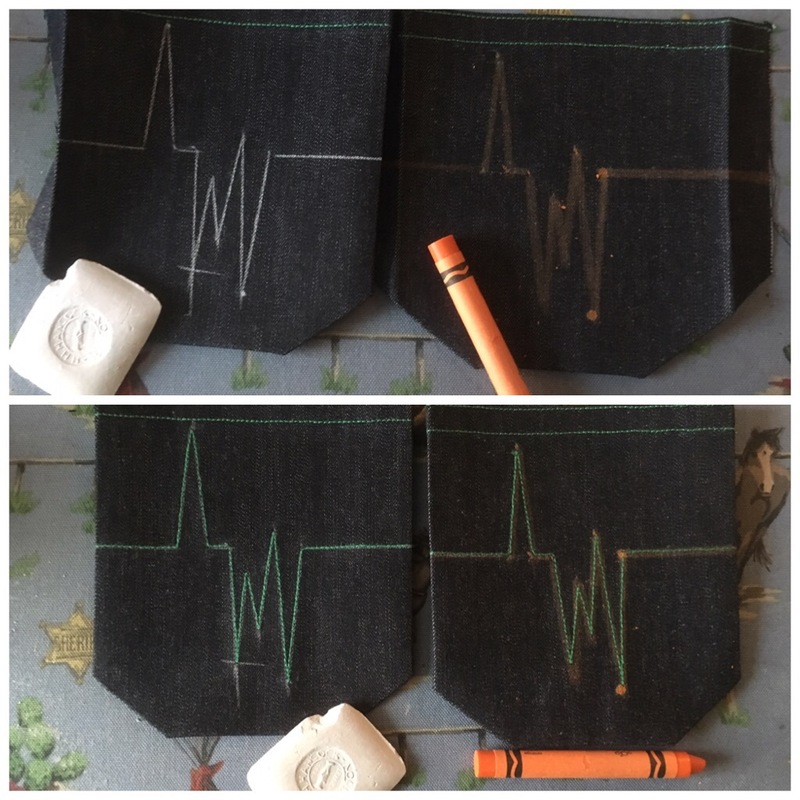 The chalk was a much more precise line to follow, but I think the stitching both turned out the same… Washing will tell for sure. Then, after another good press, I trim the seams down so that they’ll be enclosed by my second line of topstitching. Once trimmed, I use water soluble glue to hold the seams down. 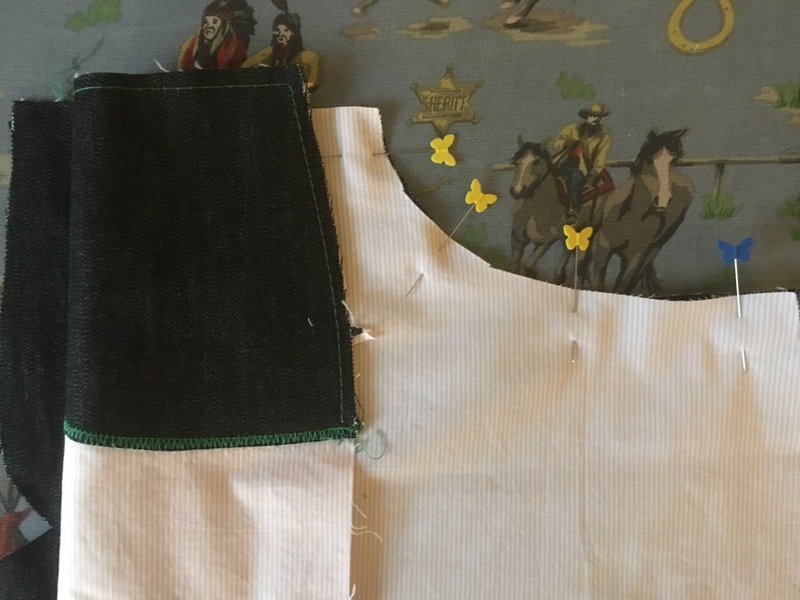 To get the back pockets symmetrically placed, first I lay the back pieces down side by side, then lay the back pockets on the placement marks. To double check I measure the distances from the edge at all the corners. Anyway, both back pockets are on. Before I put the backs away for a bit, it’s time to attach the yoke and finish the seat seam. If you’re doing this after work, you definitely want to wait until you’ve finished before opening the wine! I do this exactly the same as Morgan’s method on the Thread Theory sew along. Pin the yoke to the back WRONG sides together. Sew together with the yoke uppermost to make sure your double topstitch thread is showing by the end. Press the seams open and trim the seams of the trouser piece to about 4mm. Then press it upwards onto the yoke piece. 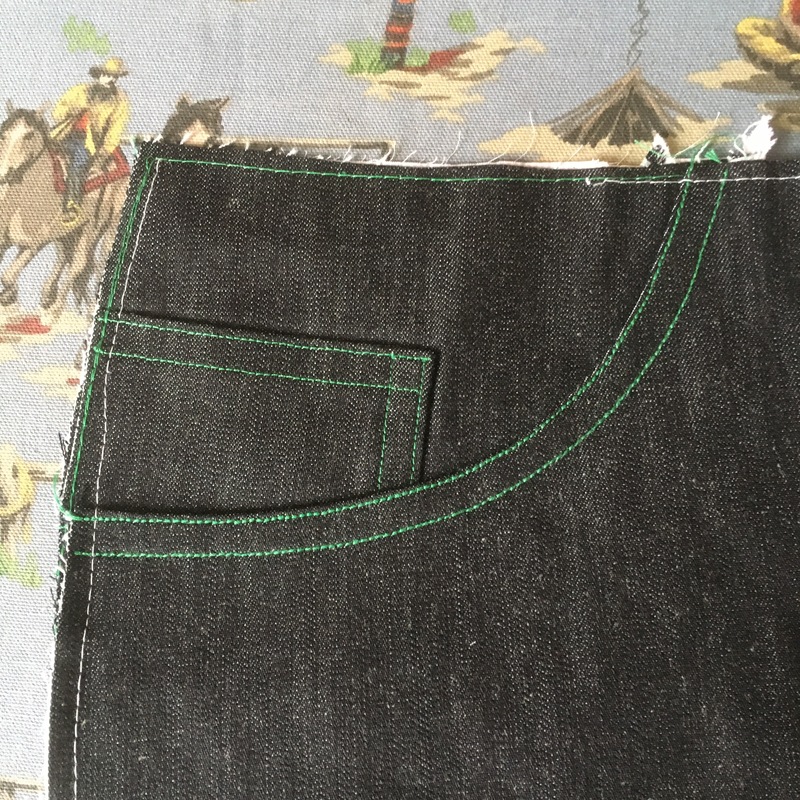 Press the whole seam down towards the trouser, concealing the raw edges under the fold. Pin and edge stitch the seam down from the right side. Match up the seat seams and sew them, right sides together making sure the flat felling lines up. 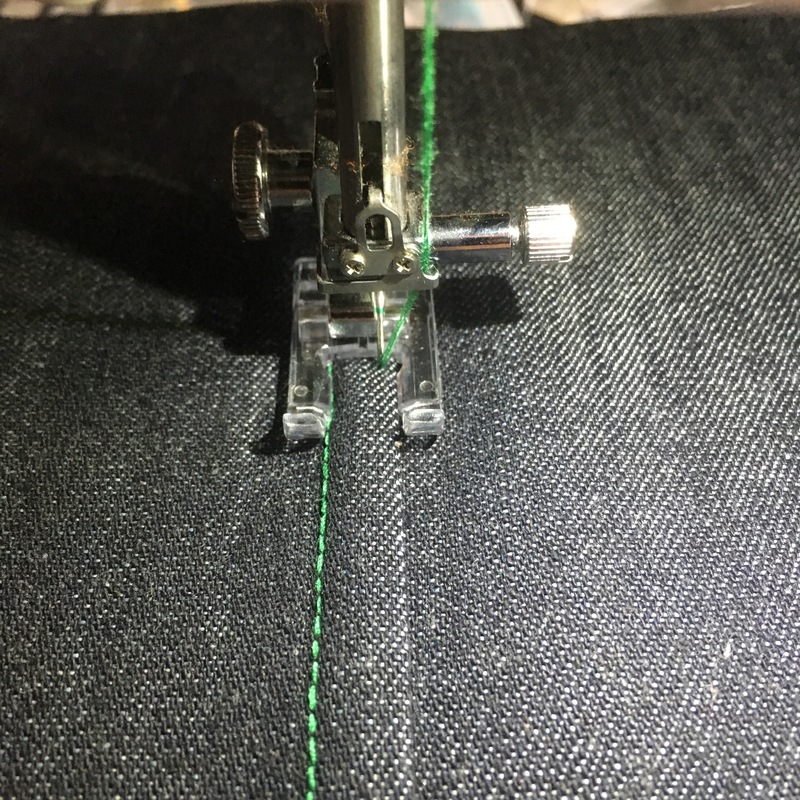 I do this by pinning the yokes together first on their stitching lines, then pin the rest of the seat seam… I’ve taken to stitching my seat seam three times! Then again, same stitch length but shift the needle two beeps right. Then again back on the sewing line at 2 or 2.2mm stitch length. So here’s the back pieces joined together with pockets attached. Baste the belt loops on and we’re done with the back pieces for now. 4cm from each side seam. 2.5cm either side of centre. 6. Attach the Front Pockets. Have your front trouser pieces facing up. Match the curves and notches to place your pocket right side down on top of it. Pin the curved edge and stitch the pocket on. Clip the seams. It’s a big curve and you want it smooth, so I clip into it a lot. Trim the seams so that the allowance will be inside the second row of topstitching. It’s a nice touch to French seam the pocket bags. Fold the pocket bags wrong sides together. Pin & sew the bottom edge using a 5mm seam allowance. 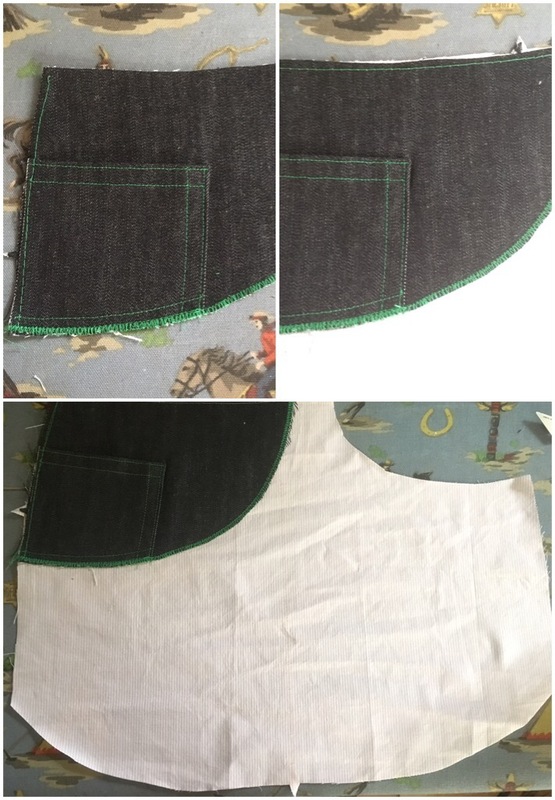 Turn and press the right way round and stitch again using 1cm seam allowance. This will make the pockets good and strong and give a nice clean finish to the insides. I was particularly fussy this time and even changed thread to match the pocket bags. Once that’s done, line them all up and baste in place. Well, so far I’ve done five evening sessions. Each between 45min to an hour and a half. There’s not really too much to do, but with the fly, flat felling the inseam, the waistband and more still to go, were maybe just over the half way mark! If you’re still reading this, I feel I should offer to make you a pair of jeans! 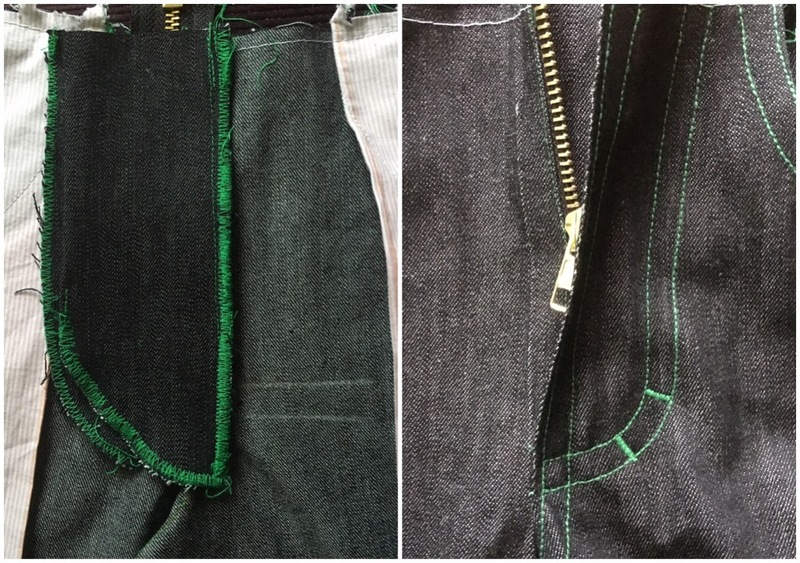 I’ve made probably 14 – 17 pairs of trousers in the two years I’ve been sewing (that shocked me when I added it up). Of course, I still find zip flies a bit daunting, but I follow Morgan’s instructions from the thread theory sewalong and apart from a couple of minor disasters, they’ve come out ok. I still don’t feel like I’ve ‘got it down’ though; even if I were to line up all the ones I considered a success, no two would look the same! This time, I followed the Thread Theory instructions, only to hit a wobble on topstitching the curve. I even managed to wobble in the exact same spot on the 2nd row of stitching! This had to come out. I waited a while until I had the patience to unpick it all and start again. I liked the idea of double topstitching the centre front too. It does take up quite a bit of space at the front though…. 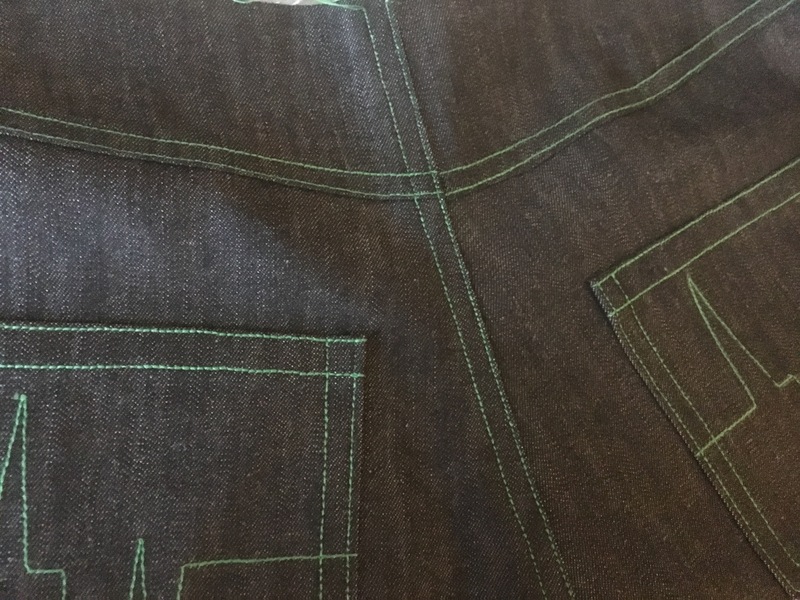 Maybe I should adjust my default topstitching measurements, but not now, it matches the pockets, I love it. Baste the centre front, back stitching & stitching from about 1.5cm below the zip stop mark. Clip at base of curve. Press fly open and crotch seam to left side. Stitch 2 rows of topstitching (double thread) to secure the crotch seam and left fly extention. 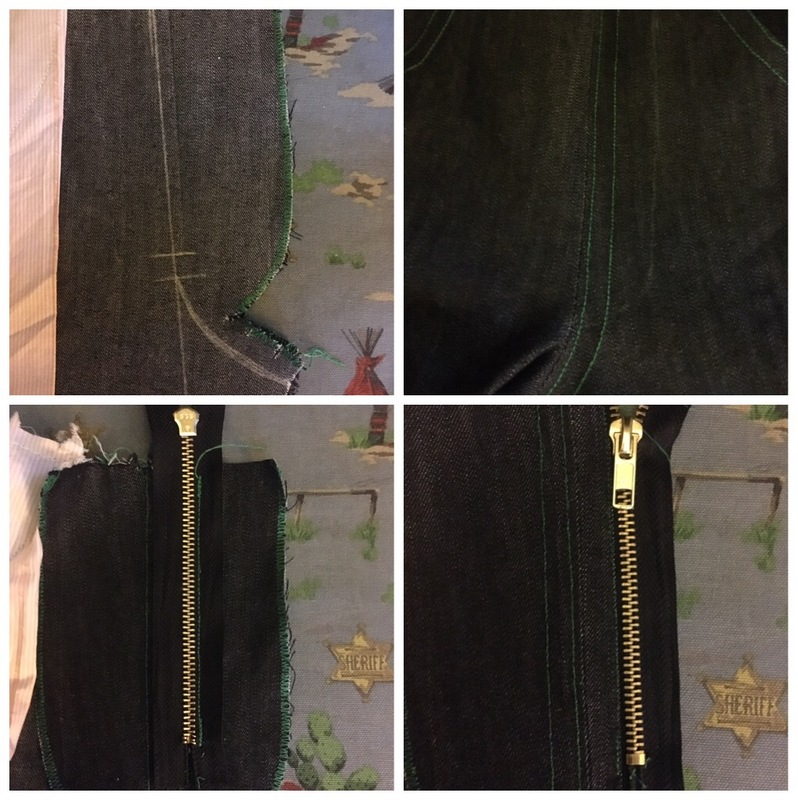 From the inside, position the teeth of the zip, face down over centre front and stitch to just the right extention. Flip over and stitch close to zip teeth. Open them up again, pull the zip over to the left creating a small overlap at centre front. Pin and stitch the left side of the zip to just the left placket. Stitch close to the teeth and again close to the edge of the zip tape. Open them up again and mark & sew your fly curve, from the right side, securing the left fly extention in place. 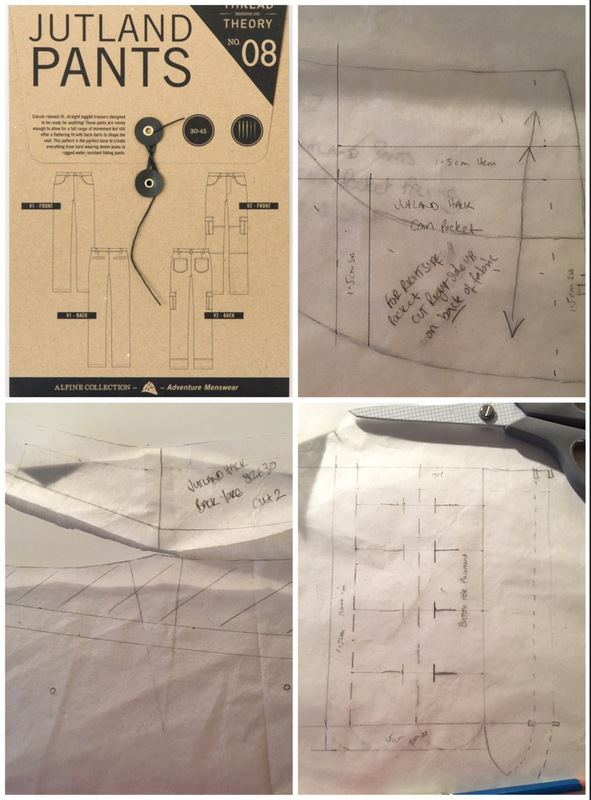 Follow the curve to create a twin line of stitching. Prepare the fly shield and sew it to the right fly extention. 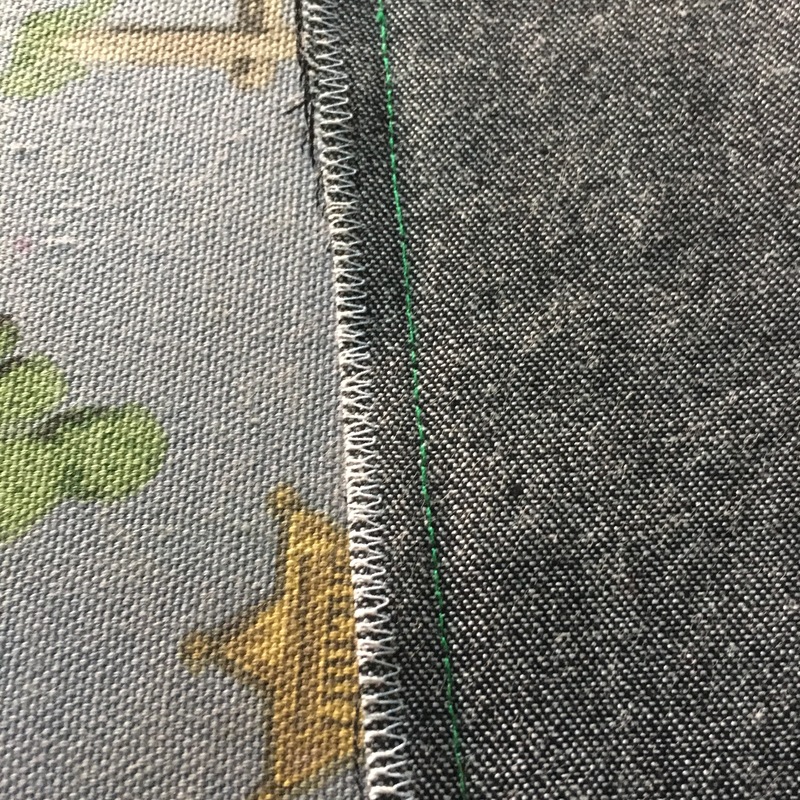 Trim the extention and finish the seam. Use your bar tacks to hold the fly shield in place at the bottom. Choose your spot and go through all layers. Unpick the basting at centre front, and the fly is finished! I ummed & ahhhd for ages about where to put the bar tacks. I even tried googling ‘fly front bar tacks’ to no(t much) avail. For no reason other than to put an end to the madness, I stuck them at 5 o clock and 10 past 3 on the fly curve. That’ll do. Unpicked the basting from above the knee both sides to the crotch. I offset the back to the front, taking approx 1.5cm at the back crotch, tapering to the knee. Re basted and tried on again. Offset the back by just a little (I managed about 1/2cm lap without skewing the fabric too much). Then I basted from knee to knee via the crotch again. Starting on the seam allowance at the knee. Increasing SA by 1/2cm along inside thigh, then back onto 1.5cm at the crotch. And guess what… They fit! So, it’s inseam, side seams, waistband & hems to go! I do this slightly differently than the thread theory instructions. There seem to be lots of different methods (& tools!) for flat felled seams. This is how I’ve taken to doing it. 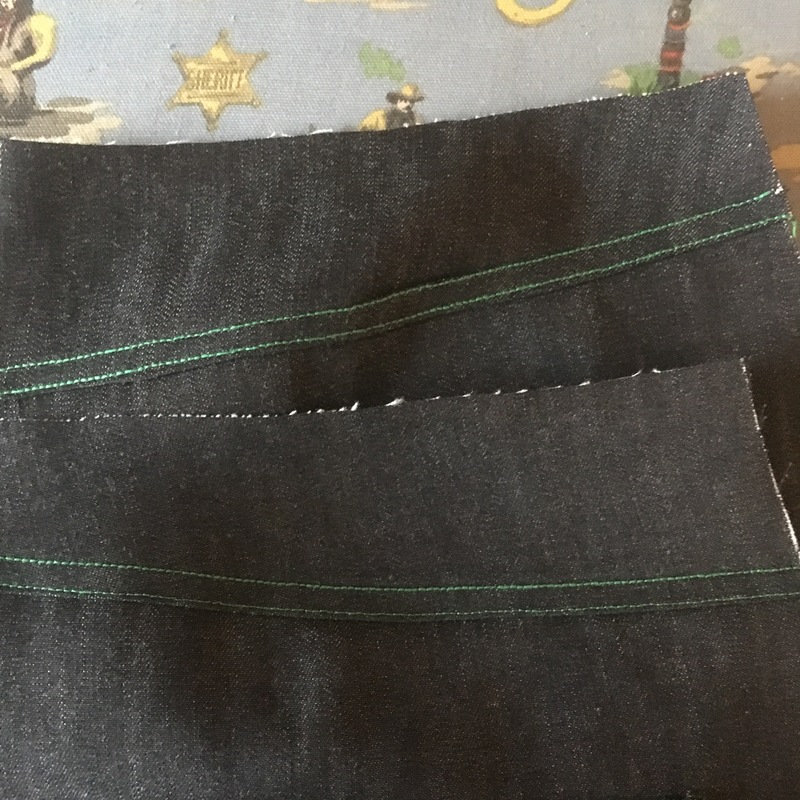 This method results in a narrower seam, but, I think gives you more control. 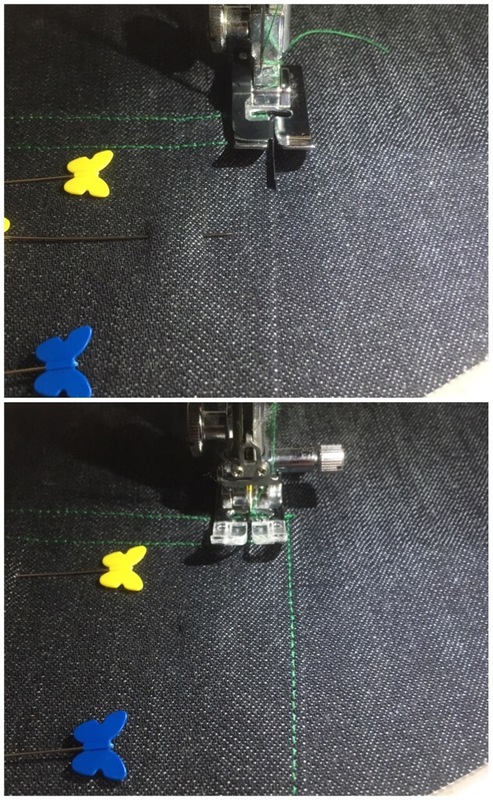 If you want to use this method & maintain a wider seam then you can increase the inside-leg seam allowance by 0.5cm. You only really need to do it to the front pieces, but I’d do it to both then there is no offsetting to confuse things. First I had to unpick the basting as I need wrong sides together. 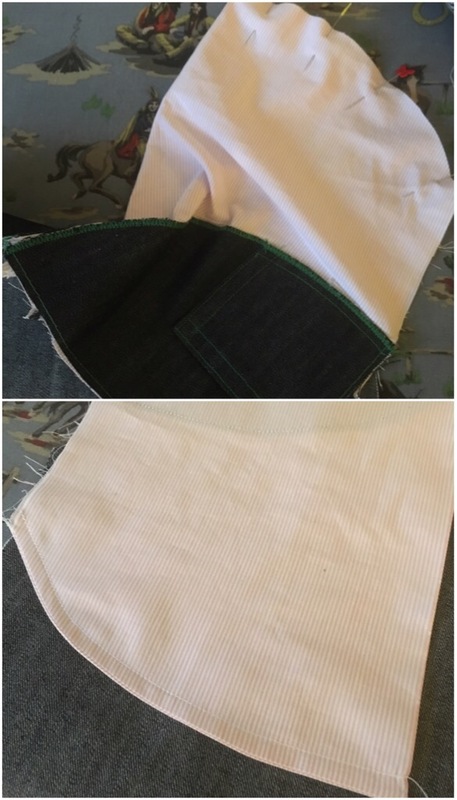 Sew the inseam, wrong sides together. Match the topstitching at the crotch. Sew with the front on top so that the double topstitching shows when the seam is finished. 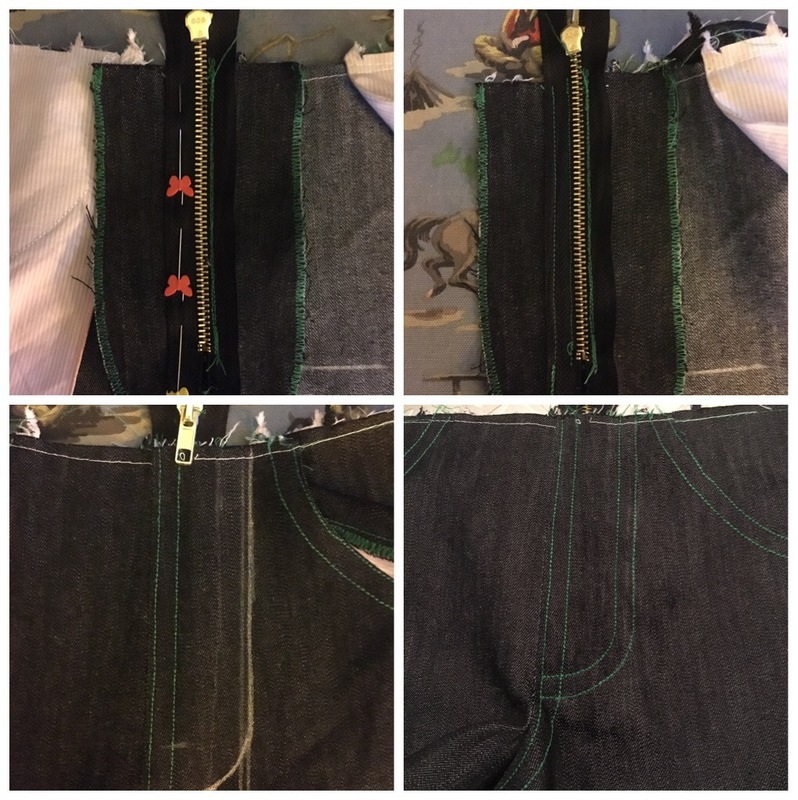 Trim the back seam allowance to less than half. Press the seams open then press the longer side over the shorter side. 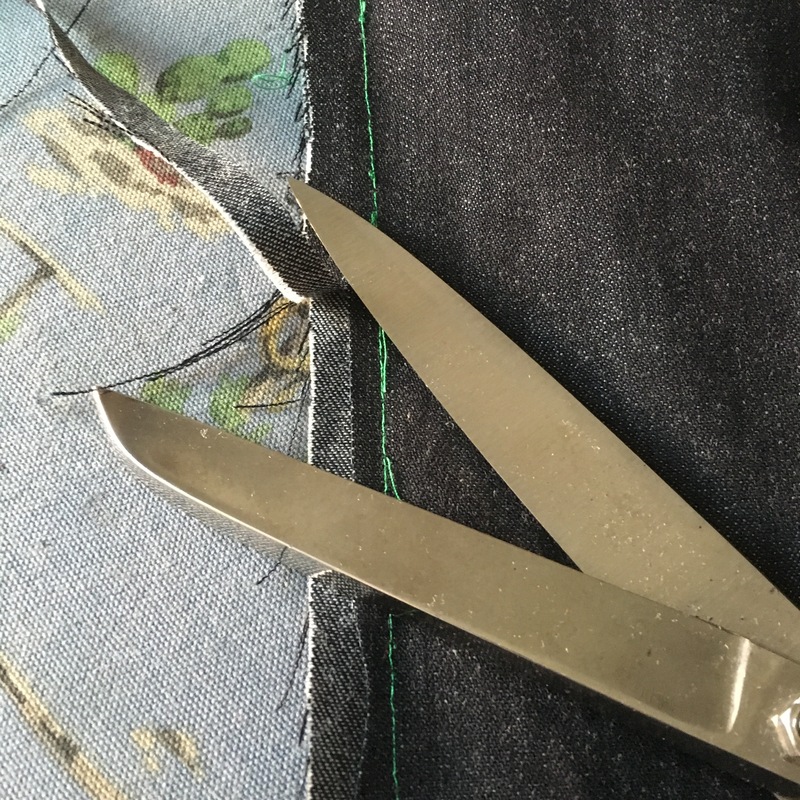 Fold the top seam over itself so that it sits under the shorter seam, enclosing the edges. Iron in place (mind your fingers!) and pin flat. And there it is finished. And from the inside, lovely. Flat felling the inseam is a bit like going to the gym… I don’t believe anyone looks forward to it, but you get a great sense of achievement afterwards! This is the easiest bit! That’s it! I don’t recommend stitching this seam down, especially if you’ve tapered the legs. I only do it if I’m making denim shorts. I find it too difficult to sew up the tube, especially with a contrasting thread. I tried 2 different ways of attaching the waistband. I’m looking for the easiest order to complete all the visible topstitching I want. I’m not sure I e found it yet! So I’ve got green-version and orange-version. Personally, I think orange-version is better. You’ll see what happened to green-version in a minute…! Baste the belt loops into position. 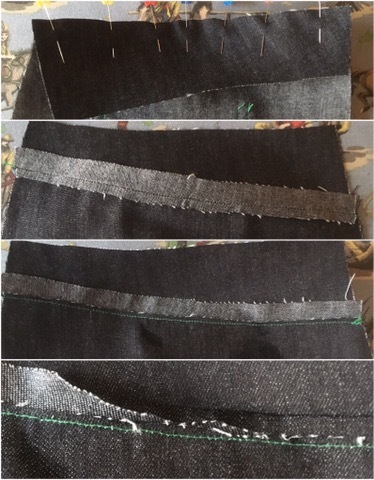 Sew the band, right sides together to the trousers. 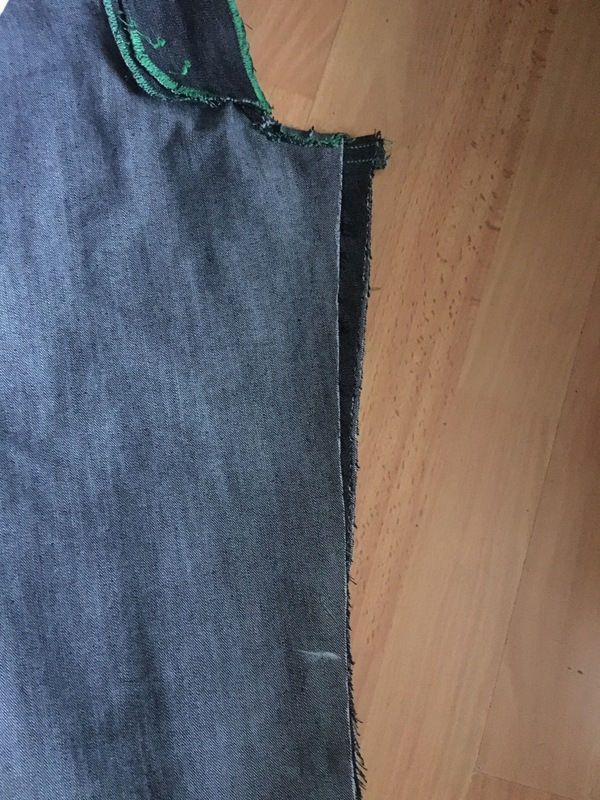 Press 1.3cm hem in inside of waistband. 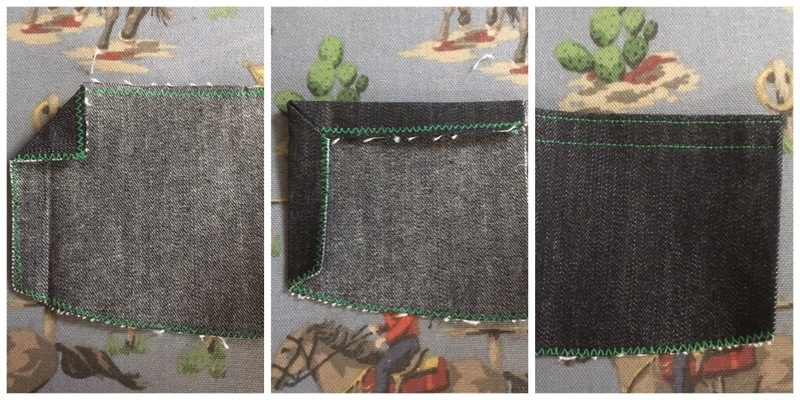 Create the ends by folding edge of band right sides together & sewing straight up in line with the front. Turn the band over and pin in the ditch from the right side. Catching the folded seam allowance at the inside. Stitch in the ditch using a matching thread. Leave the belt loops pointing down and out of the way. Still using matching thread, secure the belt loops below the waistband, to the trouser fronts. I use the width of the foot against the waistband seam to measure it. 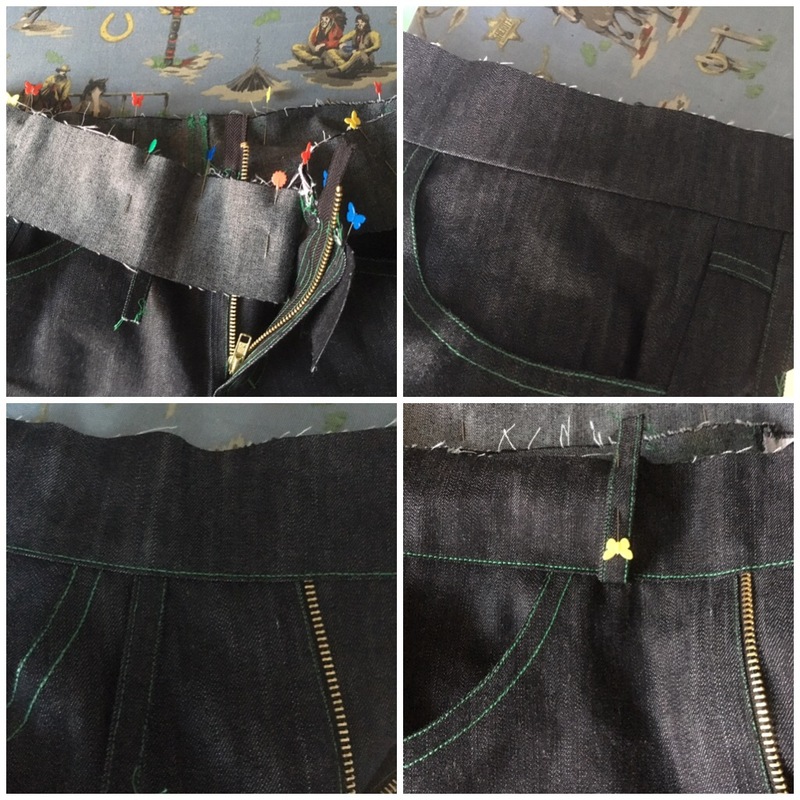 Change to topstitching thread and stitch around all sides of the waistband, close to the edge. Press the loops up, turn the ends over, stitch thoroughly in place, in line with the topstitching. Snip the ends of the loops off and put a bit of fraycheck on. Position & baste the belt loops. Pin the waistband to the top. Sew and press band & seams up. Double thread edgestitch the band close to the seam. Pin & baste the belt loops up onto the band. 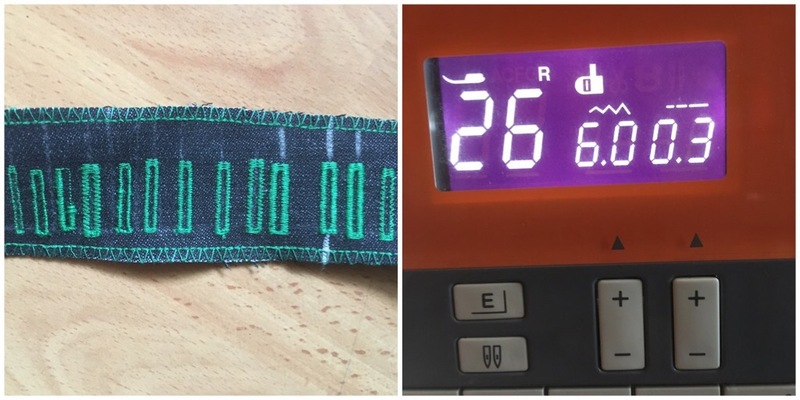 Press over 1.3cm hem on waistband facing piece. 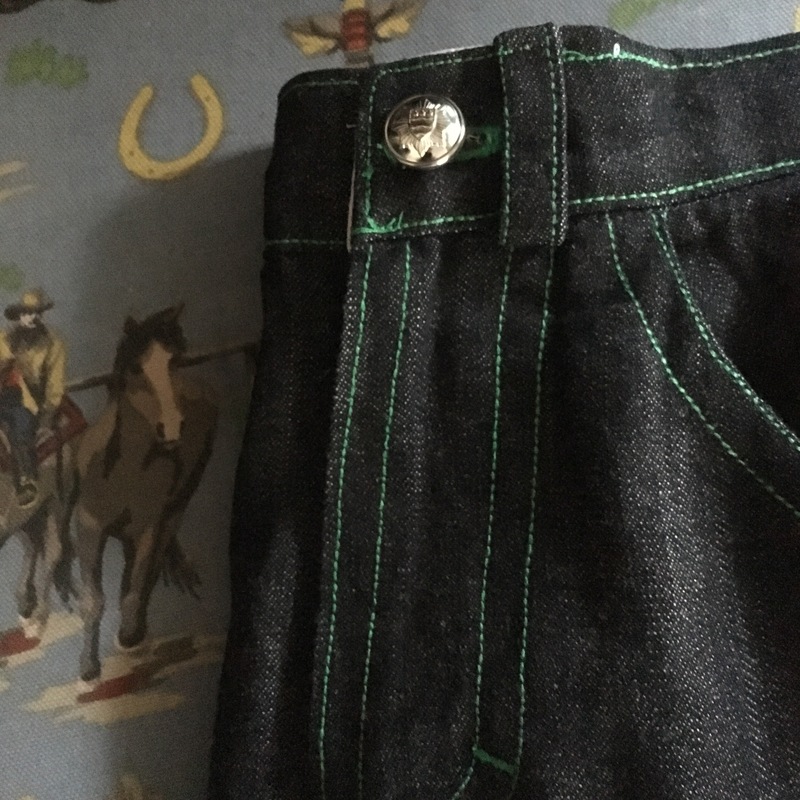 Pin to waistband. Clip, turn and press, making sure the facing isn’t showing from the front. Pin from the right side and (with matching thread) stitch in the ditch to secure the facing. Lift the belt loops out of the way and keep sewing in the ditch. Then, just before the button & buttonhole, I topstitch all the way around. This is tough going over all the fabric at the belt loops, and totally negates the point of having them tucked into the seam! Next time I’ll use the green version but stitch the tops of the loops at the end like a normal person! How do you do it? 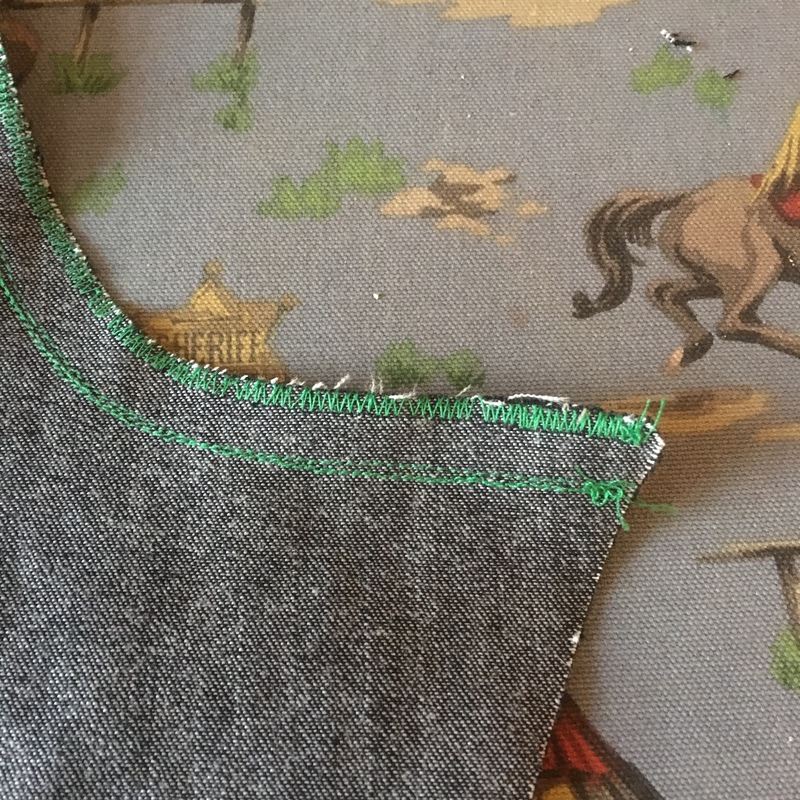 While I’ve got my double thread in, I stitch the seam down the side, from the waistband to the bottom of the pocket bag. This is both decorative and strengthens the seam. 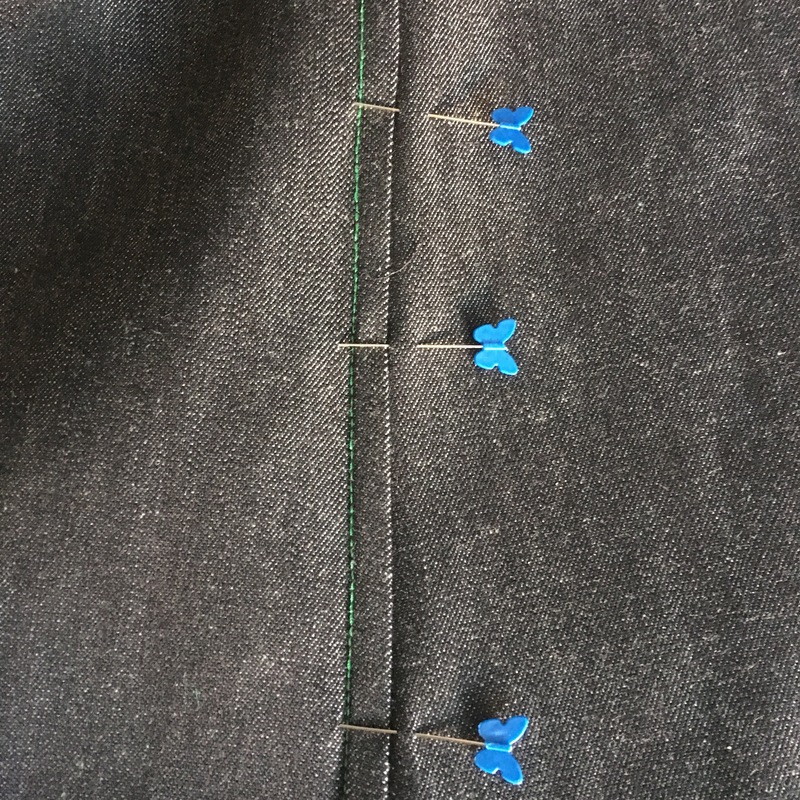 I tinkered around loads and really got to know my buttonhole settings! It was a very enjoyable half hour and, if you haven’t yet, I highly recommend you do it! 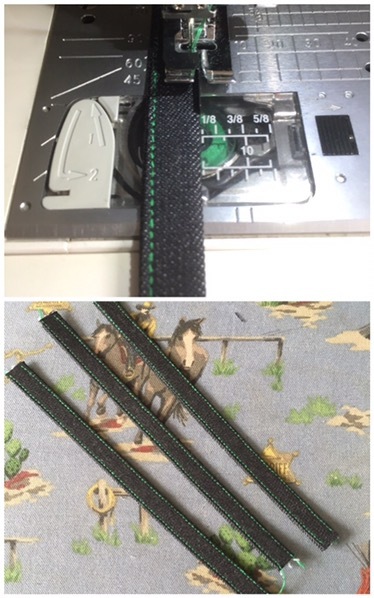 The problem came when I put the waistband into the machine. All my practice went to waste as my machine didn’t like it. I ended up having to freestyle a buttonhole using the zigzag stitch. Somehow, when I mustn’t have been looking, one of my belt loops ended up a bit close to the front and was getting in my way. I know if I start unpicking the waistband now it’ll end up like a dogs dinner, so I’m going with it. I don’t think I’ll be arrested…! 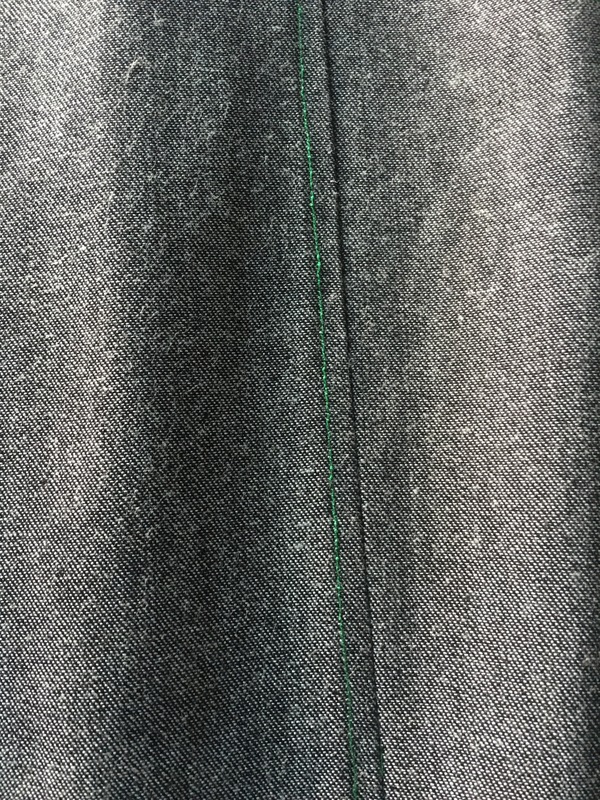 I cut the buttonhole with a sharp unpicker. I use a pin at the end to stop me from overshooting. Then, as I haven’t got the right rivets or button yet, I attached this nice button, reclaimed from a firemans uniform from oxfam. This is it! The final stage! 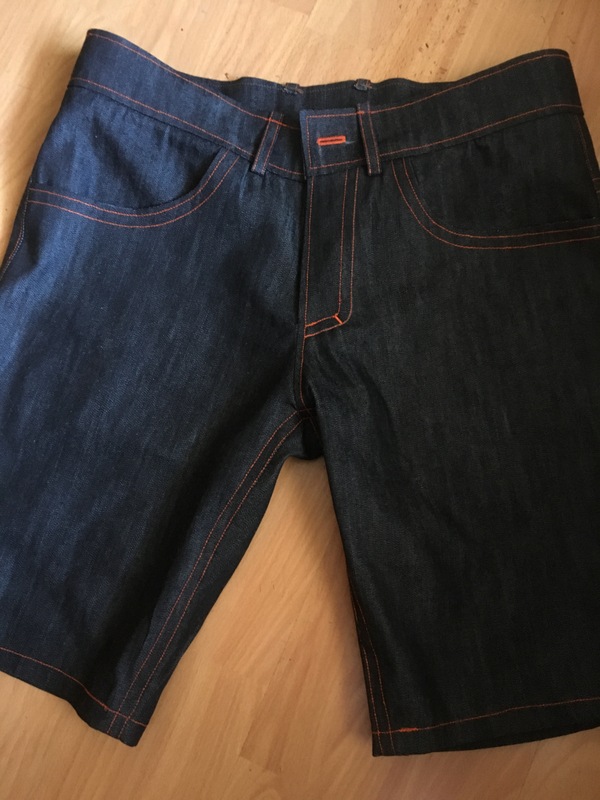 I’d already washed the fabric but I read somewhere that denim can keep shrinking for a while, so as a small concession to that, I washed them again before hemming. I put them on, put my trainers on and folded until I was happy with the length. Stupidly, I’m always nervous about hemming trousers. If they’re too short, that’s it! All over! I’m the same with putting the buttons on a shirt, I suppose it’s because it’s the last chance to muck it up! … There’s confidence for you! Ha! Blimey, if you’ve made it this far, thank you for sticking with me! 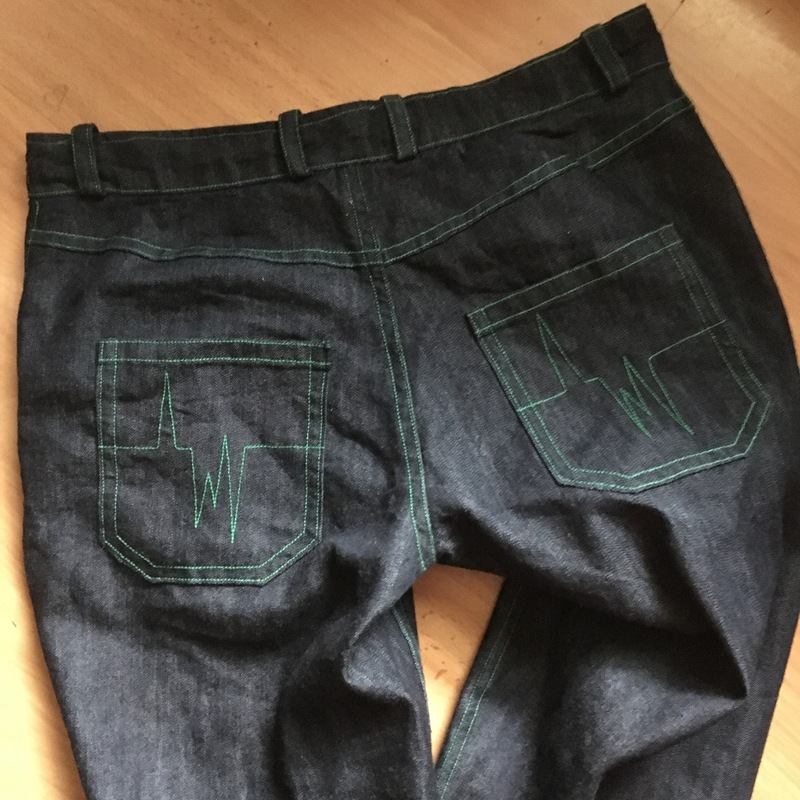 If you’ve made jeans before and can share any tips with me I’d love to hear them. 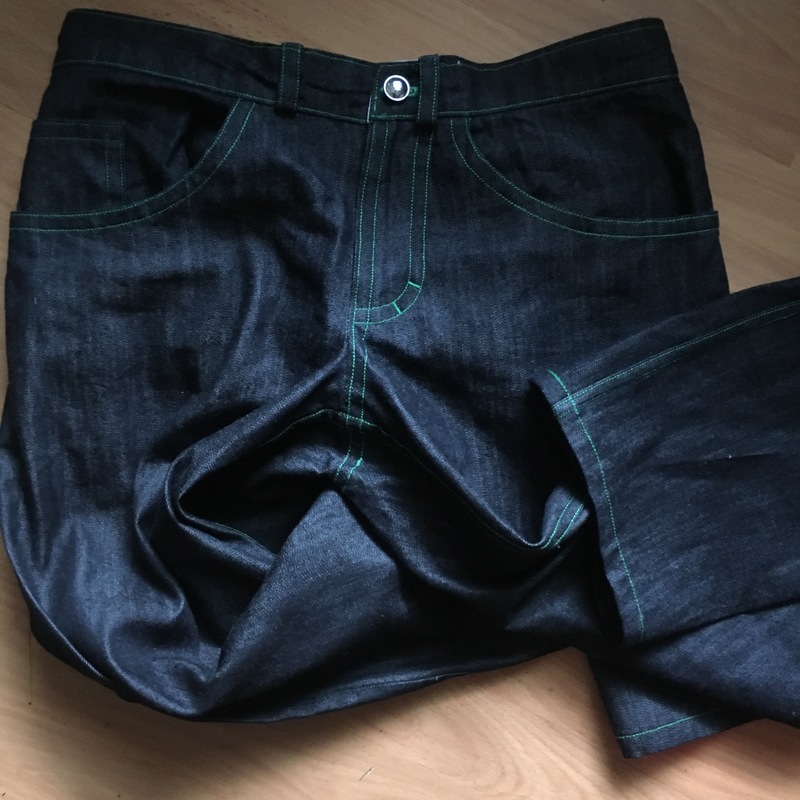 If you’ve not made jeans, I hope you feel inspired to try some. 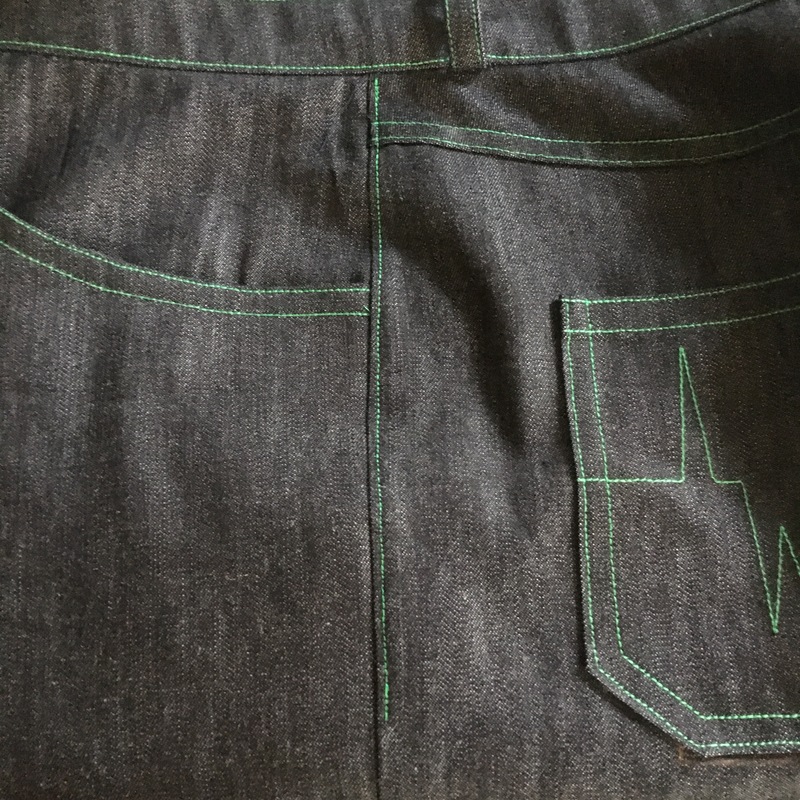 Like all big jobs, making jeans is just lots of small jobs, put together. You can move a mountain… Only just one rock at a time! Work out foolproof fly method. Always remember how rewarding flat felled seams are. Keep the bits cut off the fabric to adapt the pattern piece. sewing machine, which is massive improvement on Pfaff manual I had. 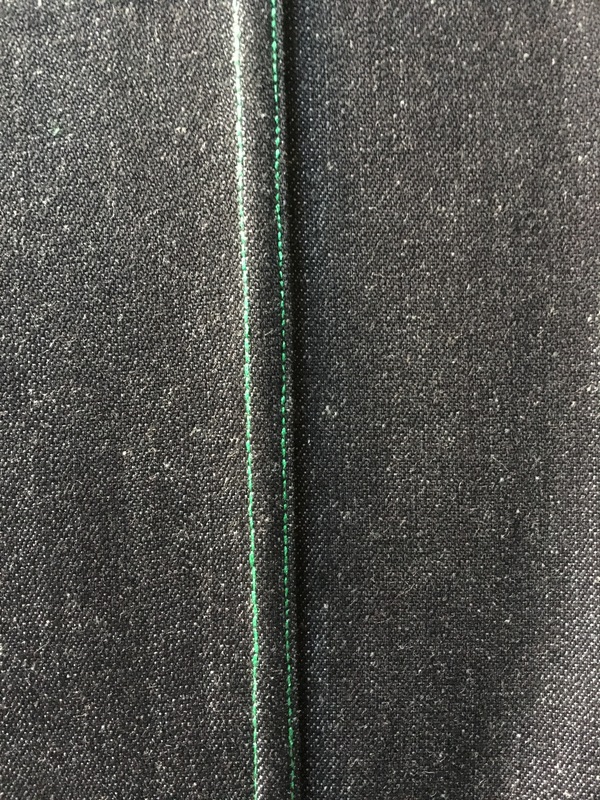 Where do you buy Thread theory patterns from please, I mainly make shirts and fleece tops as I find I can buy Jeans cheaper than making, retired now so not bothered about designer. I find that some commercial pattern instructions can be confusing and have to resort to the net for answers, maybe Thread theory could be clearer. Like the pocket designs great. The thread theory patterns have good clear instructions. I think there’s a list of stockists on the website, or try Amazon. I got to the bottom… where’s my jeans please? lol … I jest of course as I don’t even wear jeans! I might make a pair for one of my sons one day ya never know. Haha! Well done! Thank you, I was worried it was too long, but once I’d started I didn’t want to leave anything out! You’re right, I need to try topstitching thread again, I got put off it once when it played havoc with my tension … And *my* tension! … I should try again now I’m more confident tinkering with the settings. 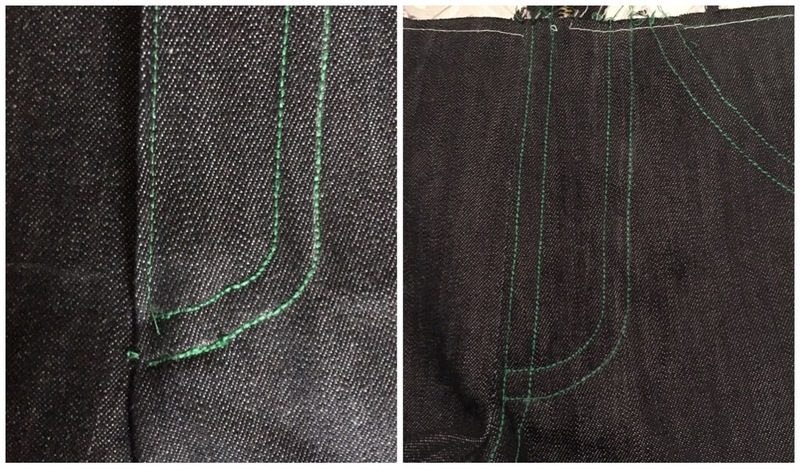 Thanks for the tips, especially on the shorter stitch length. I wondered about that & will definitely give it a go. I’ve got an old 99k with electric, I’m a bit like a rabbit out of a trap with it at the moment, so will practise a little ‘finesse’!